Heat oven to 350°F. Spray 3 cookie sheets with cooking spray. Shape cookie dough into 45 small balls. Roll each ball in desired color of decorating sugar. Place balls 1 inch apart on cookie sheets. Bake about 10 minutes or until edges are light brown. Cool 2 minutes; remove from cookie sheets to cooling racks. Cool completely, about 15 minutes. Stir food color into frosting until no streaks remain. Frost cookies, and while frosting is still soft, make 15 stacks of 3 cookies each. To make eyes, place small drop of black decorating gel in center of each miniature marshmallow. Place 2 eyes on each cookie stack. Cover remaining frosted area with cereal. Store any remaining cookies tightly covered up to 3 days. 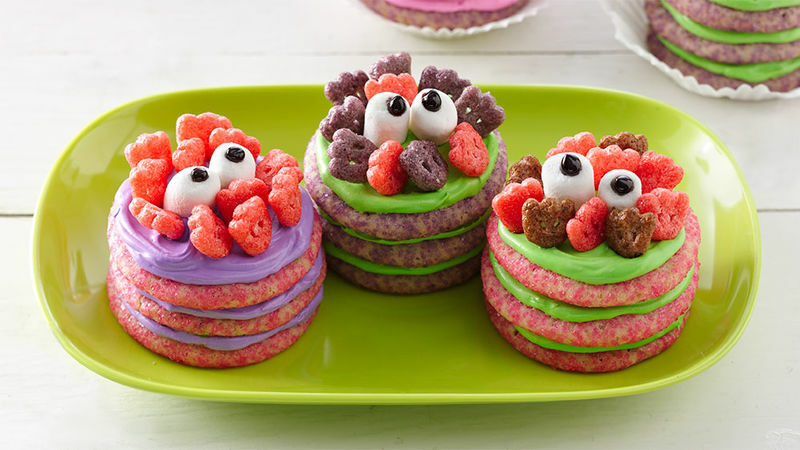 For an extra-special presentation, serve these cookie stacks in colored cupcake liners.